Your irises are many and splendid. Ours didn’t do much this year. It’s been a warm and wet start which should be good for everything but there was a sudden and heavy hail storm at a rather important time for the grapes. We’ll have to see what damage was done when the grapes start to form. What a glorious place the House of 40 Paws is. Many cats would fight for a place in the sun there. Lucky seems to make the most of every opportunity. Seems like spring is stretching you thin. Enjoy the music. Our jazz season is about to start and we’re girding our loins for the work involved. Always good to see you, Annie! Thanks for stopping by. So you have an armada of snails in the vineyard? We don’t see many snail, but do see slugs, many of them non-native. Usually they don’t go after the vines, thank goodness! Hail is something we are in fear of here. It does so much damage. We were hit hard by a June hailstorm a few years back. Vineyard and garden were set back. 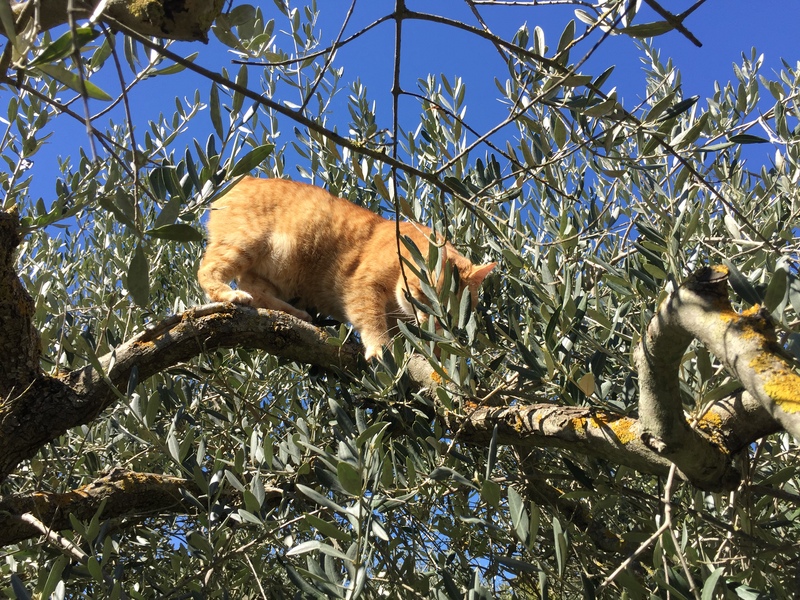 Our friends M & J have the olive farm, and olive farm cats, over in Sicily. Even they are beginning to lose track of how many paws there are. 🙂 Lucky was very lucky to have been found by our friend M on the street. She saw him struggling, and stopped to rescue him. Wish I could stop by and listen to your jazz series in the vineyard. Yes, this season is stretching us all thin! Hi there __ I bought some iris bulbs and then Tropical Storm Albert started coming and I think they got water soaked, but my new hydrangea is blooming in blues and purples and looking great! Tell Rick, if he wants air and photo time on this site, he needs to share some of his recipes. Was the radish leaves his? Always good to see Lucky out in the field getting the scoop! You take care, Lavinia and thanks for all your wonderful reading at my site, your talented posts here AND for growing Michael’s Tree!!! Always good to see you, GP, and thanks for stopping by! Your irises may be alright unless they got some kind of fungal rot from the water. I have been thinking of getting a hydrangea for here. They are beautiful! 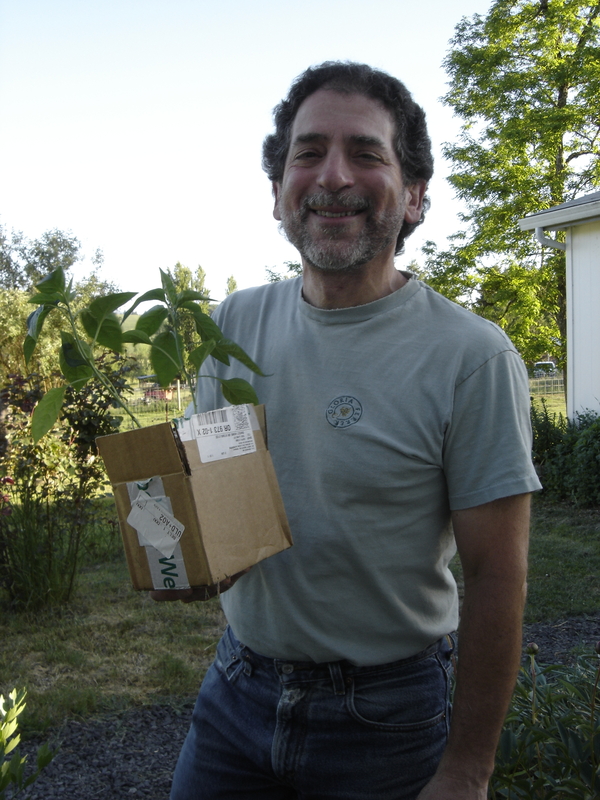 I am honored to have Micheal’s tree growing here. He was a handsome young man, so full of life and promise. We feel your loss, GP. I feel like I knew him somehow. Thank you for all your kind answers. Yes, Michael was a character, even his Captain described him that way. Never talked much, but always had that sly grin that made you wonder what he was up to or what he knew hat you didn’t!! GP, here is the radish leaves recipe from our friends in Sicily. “M” says she makes it this way. The irises are a joy to behold, and it’s lovely to have such interesting updates from such communicative and expressive felines. I love that Maori evening prayer you posted a while back. Your iris finally bloomed. They look great. Our mornings have been in the 40’s. It’s nice to hear from the Sicilian Olive Farm cats. That’s great you are getting some music in. I can really relate to “May has not been any more conducive to finishing projects at home than April…” It seems everyday life just gets in the way of everyday life these days. It’s like inverting track A that cancels out the vocals, so many aspects of everyday life seem to just cancel each other out. Your roses look wonderful! And for readers, here is the link to the 5th annual Corrales Rose Society Dr. Huey tour. All the best to you,Laurie and Tristan, and all the critters. It’s always a pleasure to read your posts and find out how each season proceeds at the farm, Lavinia. And of course I always enjoy hearing from Resident Special Correspondent Nano! Those iris are spectacular! I adore iris and ours have bloomed and moved along, so I’m glad I can enjoy yours here today. Always good to see you, Catwoods! Thanks for stopping by and for the kind comments. The seasons here all have their own story to tell, and every year it is different. Glad you enjoyed the iris. Irises do quite well in this climate, and are not usually subject to deer attacks or affected by our cool, wet winter weather. It was very enjoyable reading and I’m glad that you had a good May! The iris are gorgeous and well photographed, and I love your music! Thank you for your post. May has been a good month, and plenty busy. Over the last (almost) 15 years we have been here I have been getting more plantings in of various things. Irises do quite well in this climate, and are not usually subject to deer attacks or affected by our cool, wet winter weather. We don’t get much snow in our part of western Oregon, but it sure is rainy in winter. Sage I have trouble with, although it was hardy perennial in Connecticut. Too wet in winter for it here. Your irises are really lovely, the deer a little less so. I hope that your grapes ripen in peace. Always good to see you, Mr. Tootlepedal. Thanks for stopping by from Scotland! 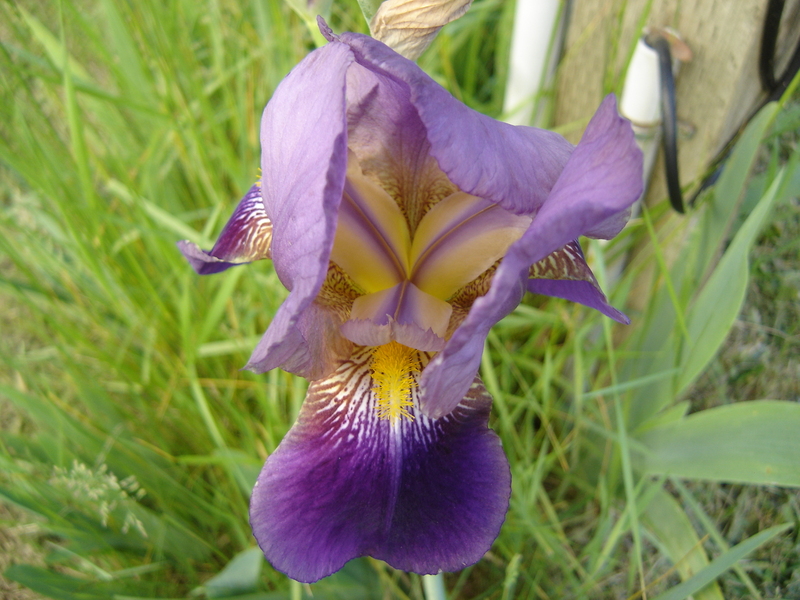 I love irises, and they generally do well in this climate and are not usually victims of deer attacks. I hope the grapes can ripen in peace without deer or hailstorms this summer. I saw my first purple Columbine on a recent trip to Wales. They are charming! Anyway, I hope you get some rain before your plants get really stressed out. Always good to see you Helen! Thanks for stopping by! 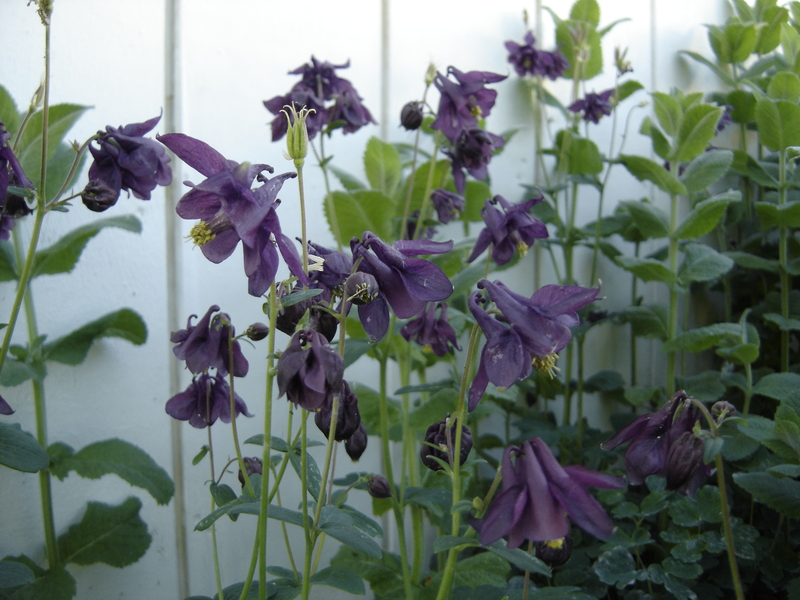 The purple columbine are good self seeders, and are establishing themselves here now. May has been unusually cool and dry. Friends in Corvallis said they got 45 minutes of rain today. We got a few sprinkles at home, and about 10 minutes of rain up in Jefferson where I was working today. Our rain was just a few sprinkles… Here’s to some rain in June! 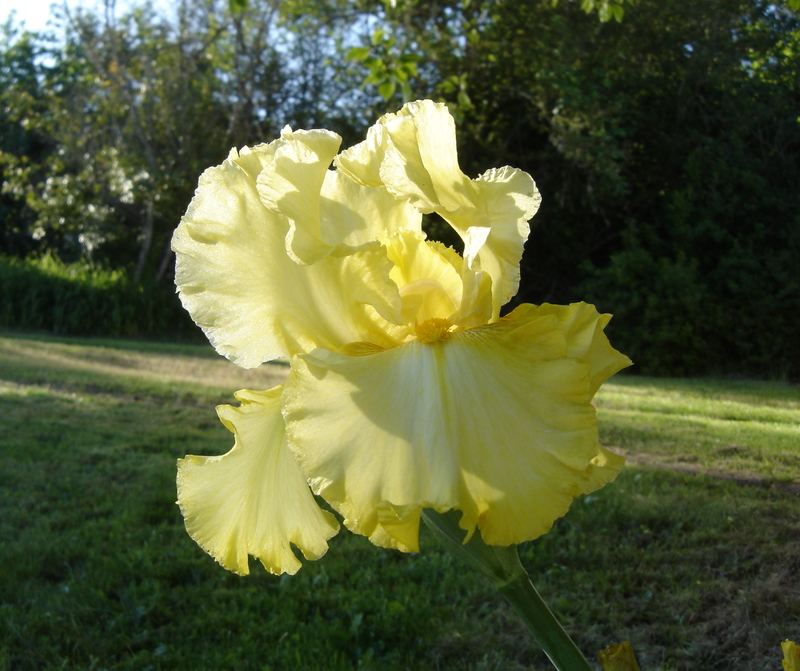 I love the idea of irises as the Marilyn Monroe of flowers. Ye, they are! 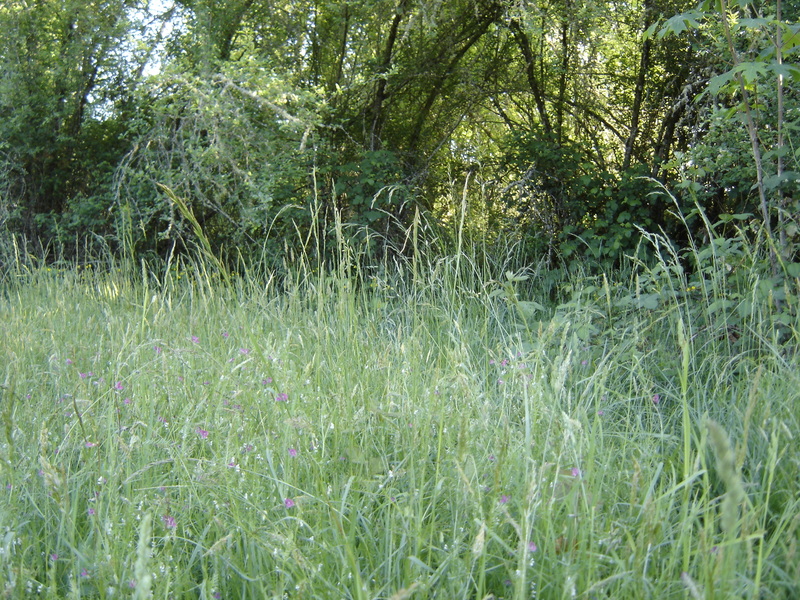 As for the deer, it seems nobody escapes some sort of depredation–whether rabbits or rats or squirrels, birds or deer. I hope they lay off soon. Do you use capsaicin? 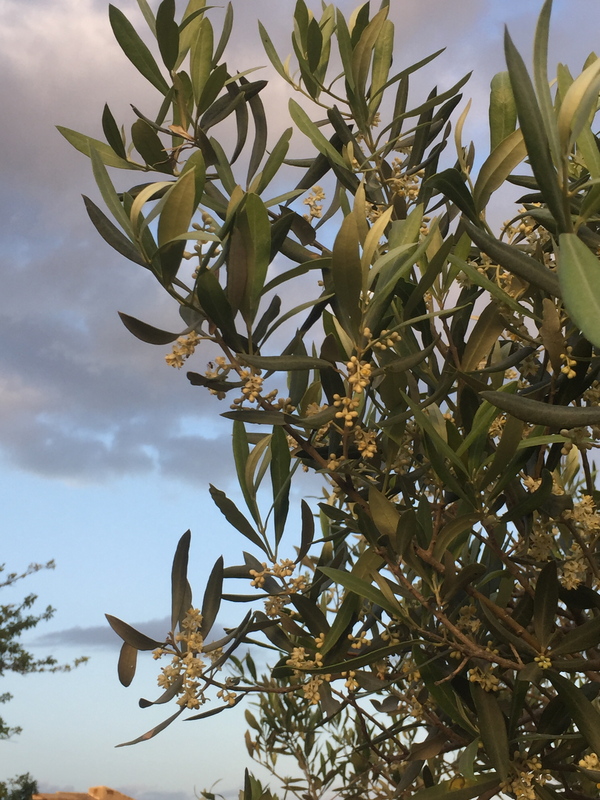 And I love the report from the olive farm! What an enterprising correspondent. Always good to see you, Arlingwoman! Thank you for stopping by! Yes, everyone must eat, and what is one critter’s restaurant is some other critter’s treasured resource. 🙂 I believe capsaicin is one of the ingredients in Deer Off. Busy, happy life! And a beautiful setting. I just noticed the first of our irises, too, and columbine in strange, unexpected places, although ours is pink. 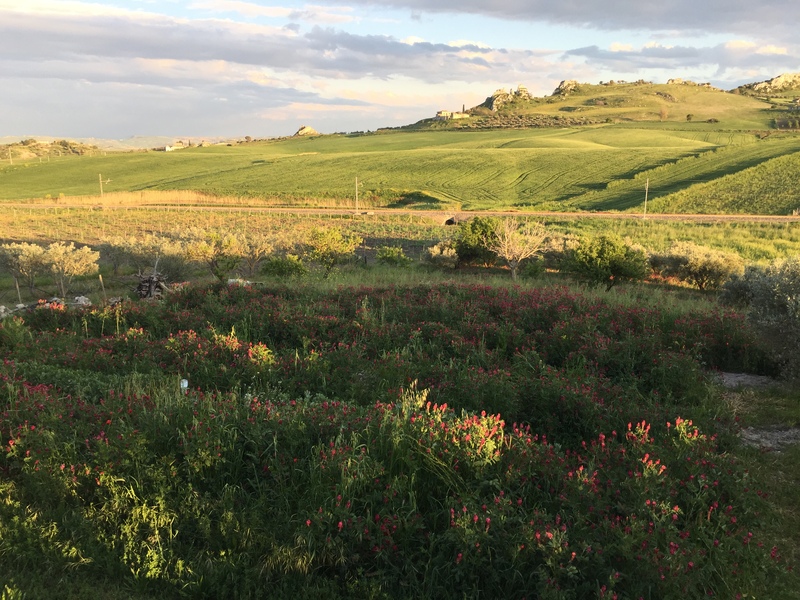 The photos of Sicily are stunning–just as I imagined it would look–and what an abundance of cats they have–all lucky, especially Lucky! I applaud your attitude about getting projects finished–all in due time . . .
Alays good to see you, Kerry, and thanks for stopping by. I would love some pink columbine too! They do seem to come up in strange unexpected places. I’ll be by to visit soon as see what you have been up to. Another blog you may want to visit is Ruit Farm. Nancy Ruit does a lot of spinning and weaving. 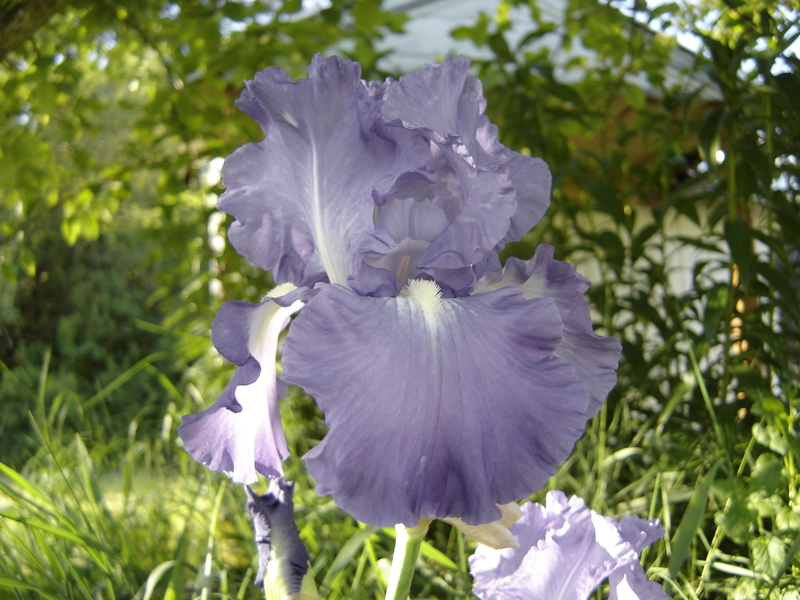 Exceptional photos of those Irises, especially the first one. As for deer, they can be a major nuisance. Fortunately there are none in our immediate area. A beautifully tranquil visit Lavinia. 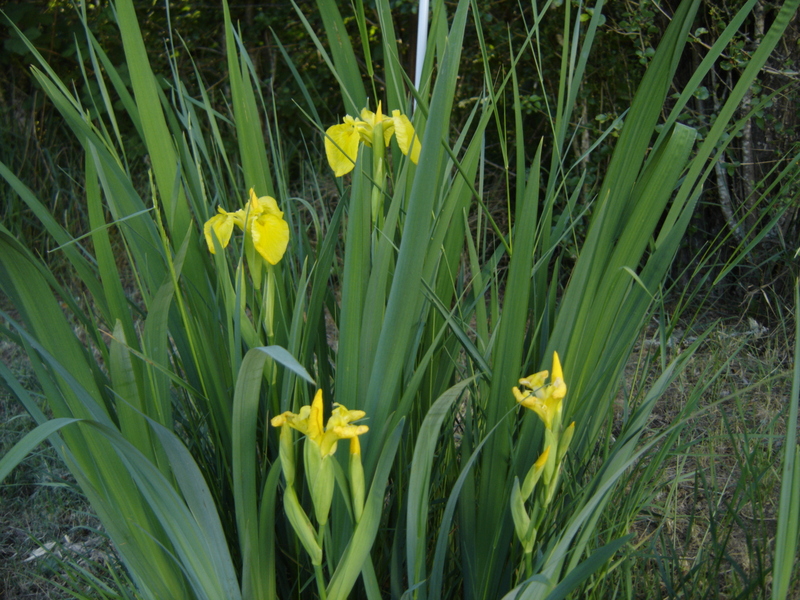 On my walk today I saw lots of irises, mainly yellow flag but some stinking iris too. There’s a single spot I knew where a patch of columbine grows, it is a beautiful bloom. I had to look up stinking iris (Iris foetidissima), as I had not heard of that one before. Thank you for that! I learned about a new plant today. Columbine has beautiful leaves as well as flowers, and seems to be relatively drought resistant. It is doing well here. Another reader mentioned pink ones, which I would like have here as well. Given that the past month was one of “those” months, I didn’t even comment on your last posting. So, in a burst of enthusiastic commitment, here I am — and it’s always such a joy to follow the goings-on at your place, and the reports from the feline correspondents. Your irises are beautiful, and I was surprised by the purple columbine. I saw my first this year, but they were yellow (or yellow and red) and I had no idea they come in other colors. They’re quite beautiful. The past week or so, I’ve been traveling in the midwest, and so have had the opportunity to see some things I usually don’t: like peonies, and cherry trees already bearing fruit. Of course, I recognized those, but there were other plants that await identification before I can post their pretty pictures — although one is a wild rose that was spreading across a native prairie. The “right time, right place” adage certainly applied there! As for deer, I had a different sort of close encounter of the deer kind while driving through Arkansas’s Ouachita mountains. I’m accustomed to deer crossing the road in front of me, but I’m not used to being able to make eye contact with one while it’s crossing! It was a little too close for my taste (and presumably for the deer’s) but no damage was done, and I got to see a beautiful creature in full, close flight, so all is well. I hope your June is a good one, with some of that rain you need. It’s August-hot here, but we’ll cope. Always good to see you, Linda! Thank you for stopping by, and for the kind comments. Yes, May was one of “those” months, and June is looking like it will be much better for me. I am far behind on many endeavors. I would love some red, yellow and pink columbine in the garden too. Once it gets established, it shows up everywhere. I have several peonies here I planted a few years ago, but only one of them is blooming. The others seem to want a new location, so I will have to dig them up and find a better spot for them. Perhaps they may spend a year or two in pots. Deer do some very strange things. Both Rick and I have been eye to eye with them, and have had at least one run into the side of the vehicle. The most bizarre deer encounter I have heard of was from a friend back in Connecticut. A deer crossed a four lane divided highway and ran into a car dealership, ending its journey by running directly into the car of customer who had brought their vehicle in for its first oil change. I wonder how the hapless customer explained that one to their insurance company. August-hot already in your area? I have been through Texas in August, many years ago, and found it quite hot then. I think our own fire season may start early here. It is drying out too early in our part of western Oregon. All the best to you, and I will visit your blogs soon. I just love your descriptions of weather and cloud formations, Lavinia! The iris are beautiful too and it’s good to see a couple of photos of Rick. 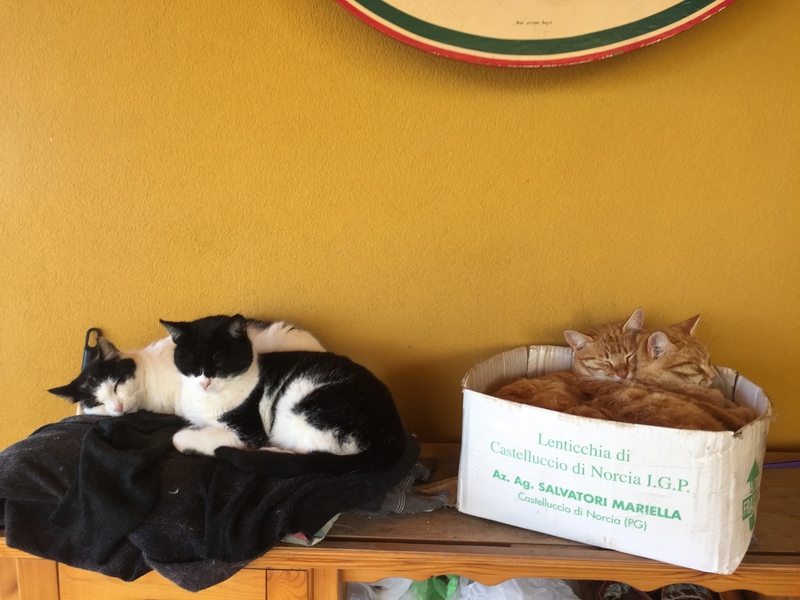 I enjoyed Lucky’s report from Sicily and seeing all those cats packed into boxes! Always good to see you, Clare! Thank you for stopping by and for all the kind comments. Weather is one thing I keep a close eye on here, and with the panoramic views, I can see it coming a long way off. Cloud watching is a favorite activity of mine. I loved those photos M. sent me of cats in boxes! I’ll let her know how much you enjoyed Lucky’s report. She also sent me the recipe for the radish leaves. She makes it this way. Thank you for the link! That looks delicious! May : Iris ‘ month. the big yellow is remarkable but the others blues ones are beautiful too. 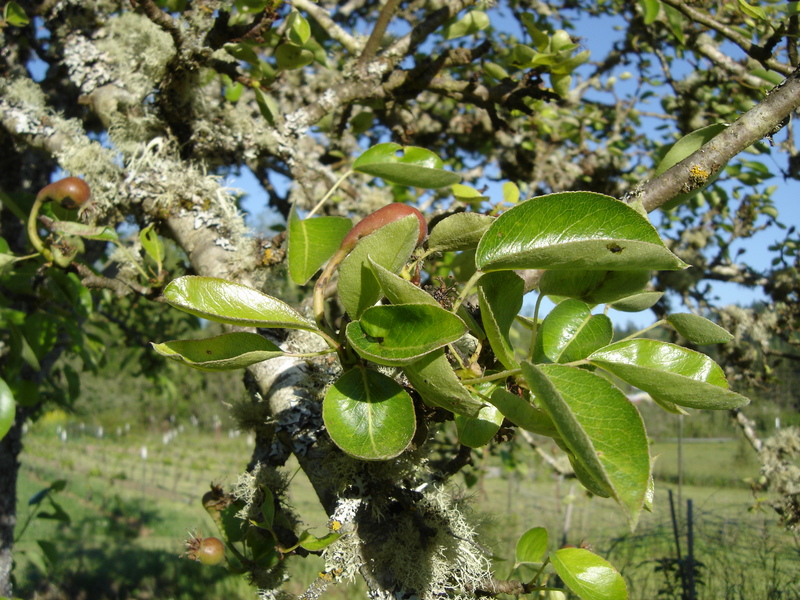 The fruits trees are producing young fruits . HAVE YOU NEED TO TREAT YOUR TREES AGAINST THE INSECT WHICH ATTACK THE FRUITS,? 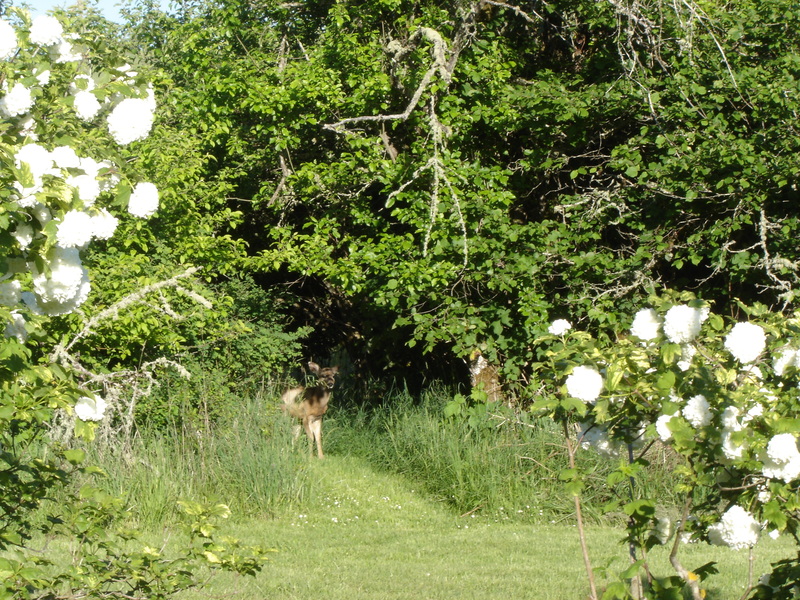 the deer destroy a part of your roses and table grapes . if I remember you need to protect your vineyard . I liked as usual , Lavinia, your description very imaged of the state of the sky and clouds of various sorts . 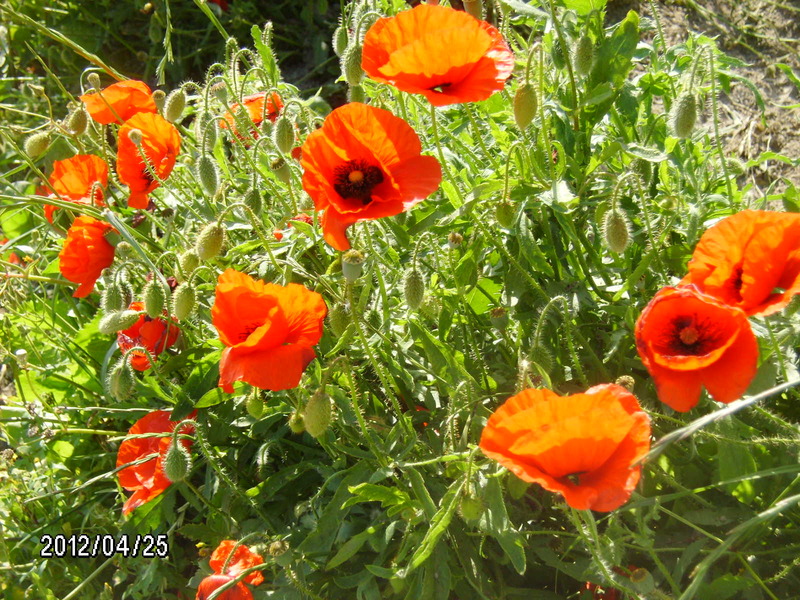 In April we had the drought with rarely violent thunder rain All of this do not improve the soil that is compact. Hard to workit principall y because of my fistula that I have to take care . Always good to see you, dear Michel! Thank you for stopping by and for all the kind comments. We don’t use any insecticides here. Our main problems are frosts in spring and drought in summer. Last year it was so hot and dry the apples did not do much, and dropped early. 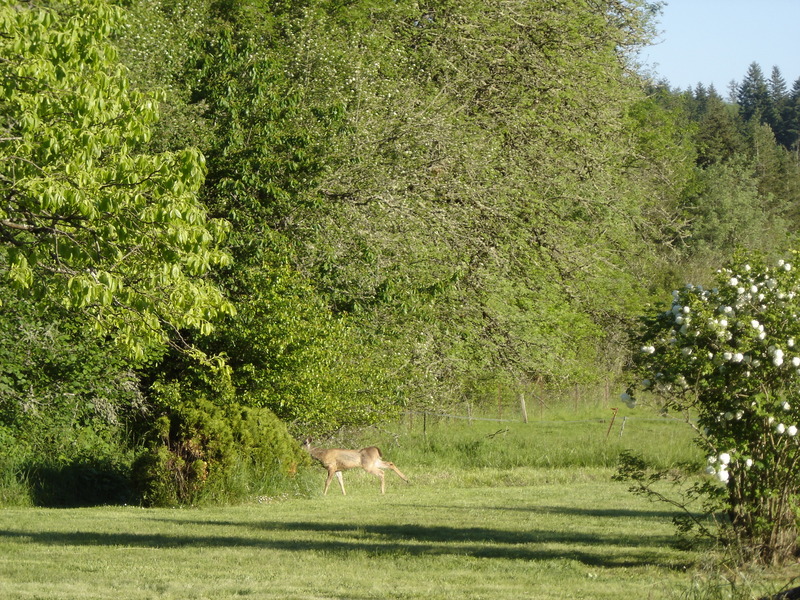 The deer are a real problem, and the pinot vineyard is behind 8 foot high (2.43 meter) deer fencing. The table grapes are exposed,but we spray the early foliage and shoots with “Deer Off”, a commercial mixture of garlic, hot peppers and rotten eggs. It looks like our drought season is starting early this year. It is only early June and the ground is getting dry and hard already. 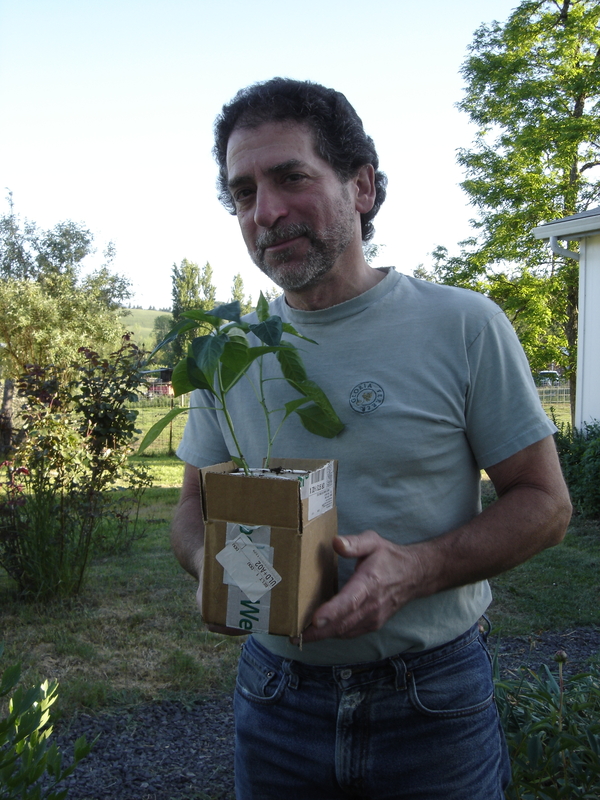 Take good care of yourself, Michel, and please be careful of that dialysis fistula when you are working in the garden. I saw the conversation with Doug in the comments section. He has many good suggestions, and lots of experience going through dialysis. I see that like here the drought tends to dominate in the spring. We had only one day of heavy storm rain and that is all. The clay soil is difficult to work (too hard or too pasty). I do what I can in the garden. Janine takes a good part of it despite his fractured shoulder humerus in January 2017. Normally, the rainy season is October through June, but this month of May has been unusually dry. We also have heavy clay soil, and it is hard to work. Janine is amazing with all that she does! I hope her shoulder is not hurting too much. Please send her my best wishes. You are in my thoughts and prayers regarding your dialysis procedures. Wishing you all the best! Always good to see you, dear Nia! Thank you for stopping by, and for all the kind comments! 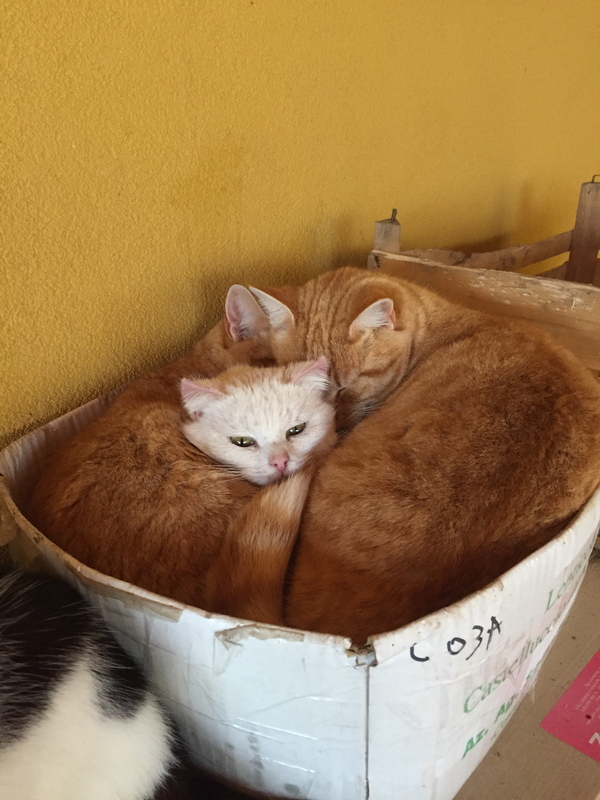 This month’s cat report was from our friends in Sicily. 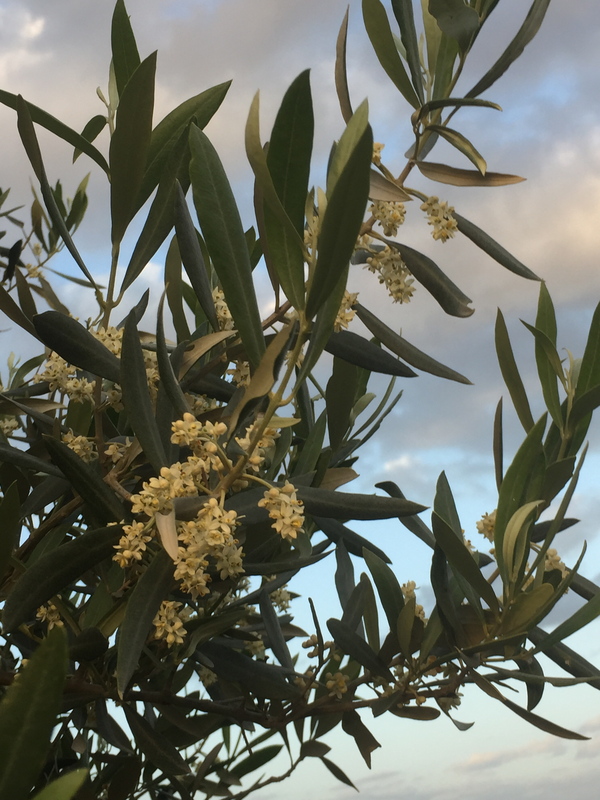 We have never been there, but would love to visit them on their olive farm. They have taken in many cats and dogs in their area. So your Ibis cat has a friend now? Thank you for rescuing that other little cat who was abandoned. You are a wonderful person, Nia. I am way behind with many of you, and will be by to visit your blog soon. This year has been particularly hard. Our Lucio cat goes to the vet this morning. He has some sort of small mammary tumor needing to be looked at. Mammary cancer is common in cats, but rare in males. I am hoping it is just another granuloma, which he is prone to showing up with now and then. Always good to see you Julie, and thanks for stopping by from Frog Pond Farm in New Zealand, and for all the kind comments! 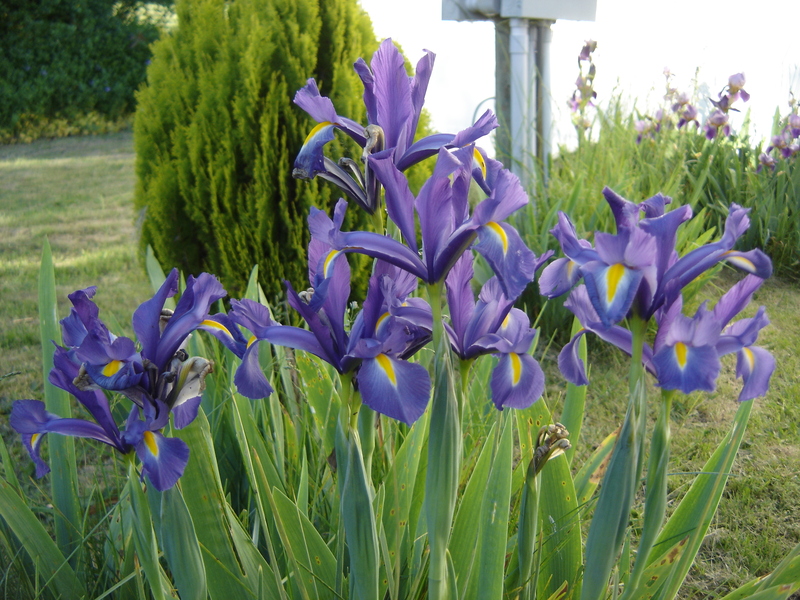 The irises are beautiful in May, and I look forward to them every year. We have wild turkeys around here too, but have not seen one in the vineyard, yet. I’ve been told they can strip the vines of fruit rather quickly. I will let M & J know how much you enjoyed Lucky’s update. We’re always happy to have him weigh in from time to time. Glad to hear Lucio is recovering – they can be a worry when they are ill. The farm always looks good, but with the addition of irises (my favourite flower) it is truly beautiful. Always good to see you, Quercus, and thanks for stopping by from England! Lucio gave us some worry for a bit there, but he is doing well on the antibiotics nows and should fully recover. I am glad it was not mammary cancer, which I have read is the 3rd leading cancer in cats, but rare in males. Irises are such beauties! I acquired a few more over the weekend, and they are sitting in a pot right now until I can decide where to put them. One can never have enough irises. Lucky was a very lucky cat to have our friend M. find him on the street. He has adapted beautifully to farm life and seems to have more than compensated for his lack of vision. Give our best to Julia, and thanks again for visiting! I was sitting by a pond in the sun today, watching wagtails and yellow flag irises. Just needed a cat to achieve perfection. That sounds like a beautiful, tranquil way to spend the day. A cat would indeed be perfection! 🙂 I’ll be over to have a look at your post. Just stopped by and found it. That is a beautiful rose photo, too! Always good to see you, Anarette! Thanks for stopping by, and I’ll be glad to send you some of the cooler air! The lack of rain is beginning to worry us, as it has been unusually dry for May. Fire season may come a month early. Always good to see you, Jeanne, and thanks for stopping by and for the kind comments! 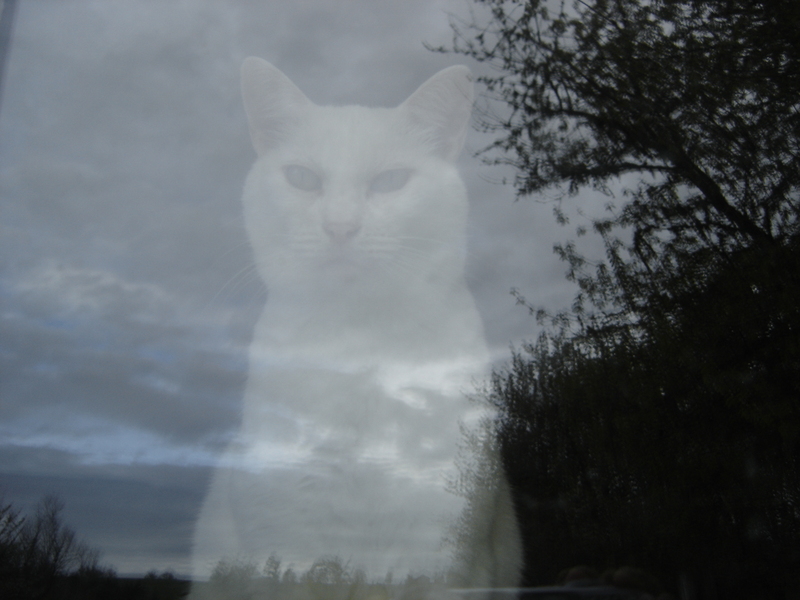 Yes, Lucky seems to have developed his other senses with time. When our friend M.found him on the street many years ago, he was falling off curbs and bumping into things. His eyes were badly infected and needed removal. I thoroughly enjoyed your post and the photos. Those iris are wonderful. I lost my irises last winter and did not get any this year. Instead I planted some hyacinths and they were wonderful, pretty blue and fragrant. Sorry about your deer problem. So far deer has not found my place yet. They have been to the other side of the lake from us. They love roses and that is a bit worrisome for me. I planted a grapevine this year and it will be interesting to see what happens. It took a while for it to leaf out. I envy you with your big place and so beautiful. Love you description about the place and the weather and the feline correspondent and its report. Always good to see you, Rosalinda! Thank you for stopping by and for all the kind comments! I love hyacinths, too, and have some blue and pink ones growing in a barrel planter. You are lucky the deer have not found you. 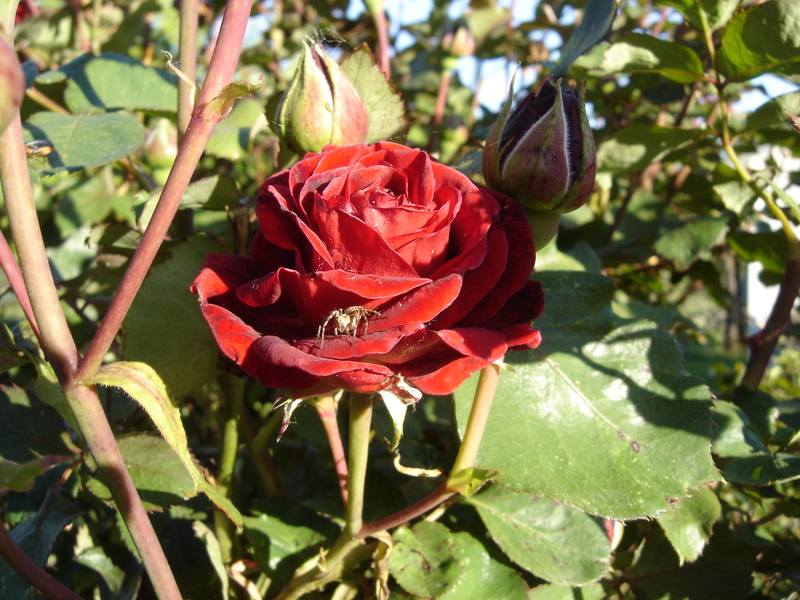 They love roses,and can severely nip them back. I love your collection of roses and all the beautiful photos of them and descriptions on your site. I will be catching up with your other blog on the Philippines and history shortly. 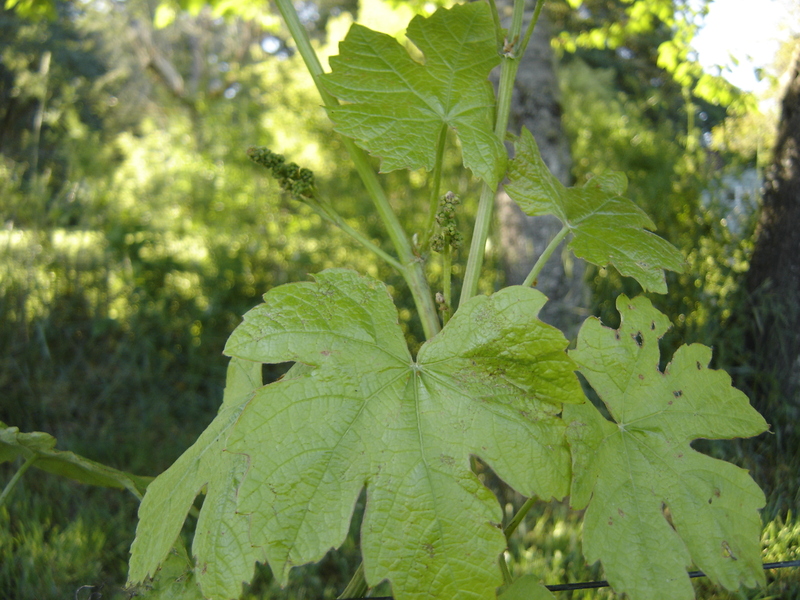 Grape vines are generally quite hardy and tough to kill. If it is one of the Vitus vinifera grapes, they are subject to Phylloxera. I am very glad to hear that you are playing out again, dear Lavinia. Your talent and storytelling are a joy. And your pix in this post: where does one begin? Oh, the irises, of course. Such gorgeous flowers. and the columbines. 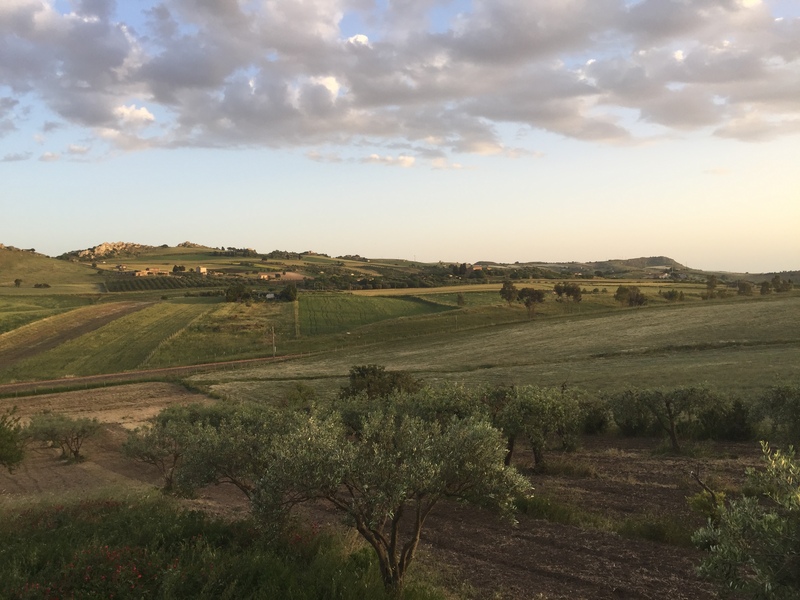 And the views from the farm (including Rick of course) and the Sicilian countryside — including Mr. Lucky of course — and the others too. I’m wishing your vines an “uneventful summer and good grape” harvest too! Always good to see you, Cynthia! Thanks for stopping by and all the kind comments. Summer is life in the fast lane here, especially this year. Irises grace the month of May here. All have passed by now, but we still have those photos to remember them by. Some of them are reblooming irises, and it is possible we will see them again in early fall before the weather gets too cold and wet. They do not like summer heat! We were a bit worried yesterday when a large storm front came through, dropping heavy rain. 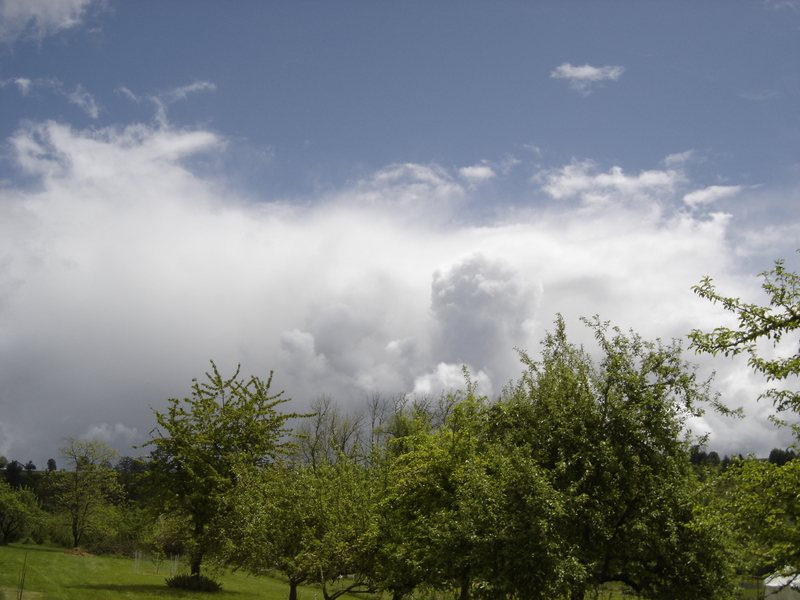 Fortunately, we did not get hail, which has set us back in some past years. We are looking forward to the rest of summer being “uneventful”, and a good grape harvest. 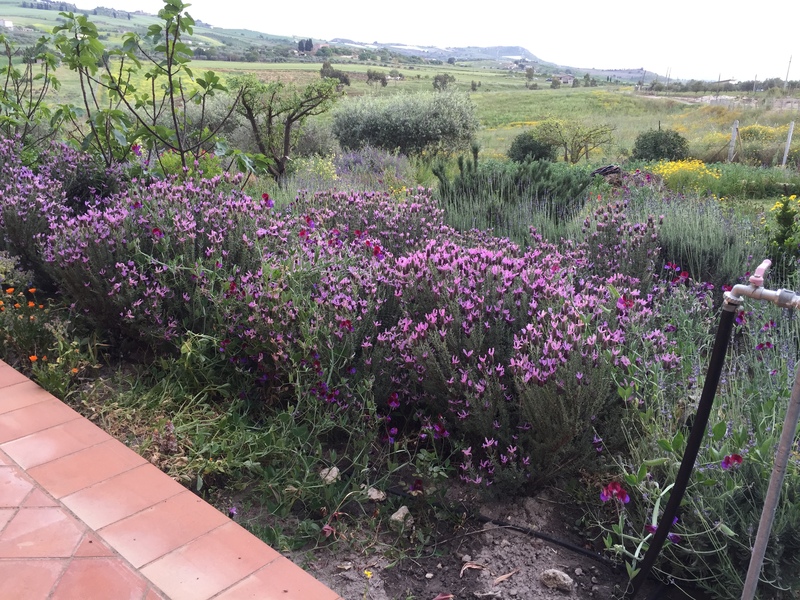 The feline sicilian correspondent made a rich report .I enjoyed the Lavender which I have not in my garden . But I have sage very visited by bumblebees. At last the Sulla , fixing the nitrogen is new also for me . Thank Lavinia to report the report . Thank you, Michel! I will tell Mr. Lucky cat and our friends in Sicily how much you enjoyed his report! Lucky is a true teacher, and manages quite well even though he is blind. I have one lavender plant here, but have had trouble growing sage. It dies back after a year, possibly to to phytophthora in the soil with out wet autumn, winter and spring conditions. 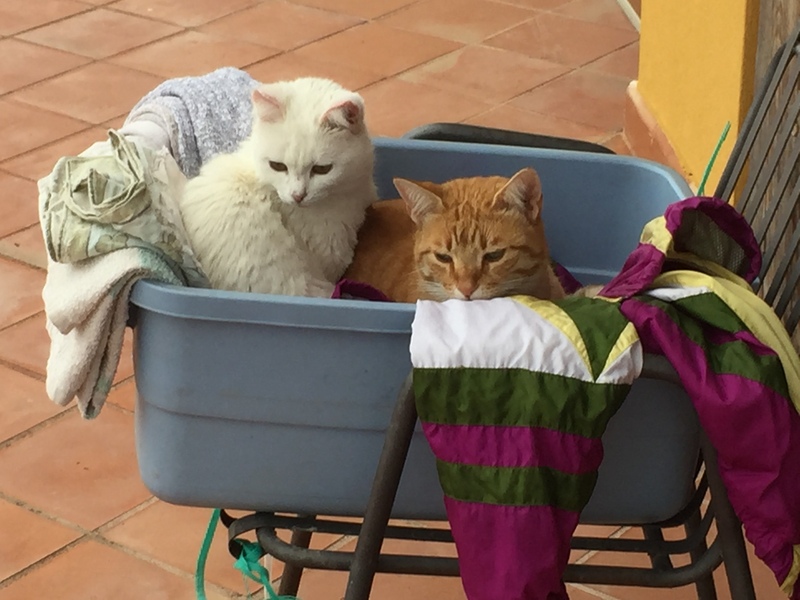 Michel – a reply to you from Lucky the blind cat and his cat mother, my friend M. over in Sicily. Hi Lavinia. How beautiful Salmon Brook Farms is in the spring! I do love irises and yours are gorgeous. I enjoyed all the photos and all the kitties. Crystal seems to be adapting to her new regimen of prescription food and monthly shots. She sends a purr to all the cats. Love and hugs to you and yours. Teagan, I am glad to see you, and as always, thanks for stopping by! I just got back from harp guitar retreat. I just found you in the SPAM filter, and am sorry you have sat in there. I have no idea why you ended up in there. Thank you so much for the kind comments, and it is good to hear Crystal is doing well on the new regimen. The June post is late, and I hope to get it out this week. Much love, hugs and purrs back to to you both. Yesterday Crystal had the appointment for her next (monthly) steroid shot — and the vet said she no longer needs them. She’s still on the prescription food, but she hates it… So Not sure if I will be able to keep a healthy weight on her. Have a very happy Fourth of July. Hugs! And a happy Fourth of July back to you, too, Teagan and Crystal! We are having trouble keeping weight on Willow now, as her kidneys are going. She is roughly in the neighborhood of 22 years old, as best we can tell. I’m doing her pee towel laundry twice a day at this point, and going through a lot of doggie pee pads. Oh isn’t your Marilyn perfect! Blonde, beautiful but a little blousy and over the top;-) Must look for a bulb for next summer. Glad to see that you and Rick are keeping busy but happy. Always good to see you! Thanks for stopping by from Canada, and for the kind comments! Those reblooming iris are also scented. I caught Marilyn in juts the right lighting. She is a beauty! Life is running at a good clip here this summer, and my June post is way behind. I hope to get it out this week, but it may piggyback onto July’s post at the end of the month. Best to you and your family, Ivy and Romy. Lavinia i wrote this comment in your tubre for Remembered Goodbyes in You Tube . I have appreciated the good harmony of the sounds. Thank you so much for listening, Michel! I am late with my June post due to all the work here. I will include June along with July at the end of this month. I hope by now you’ve gotten the rain you need. In Austin we’re grateful for the rain that’s coming down even as I type this. Summer is our normal drought period, with little to no rain from July though late September or early October. This year it has started earlier than usual. We are still getting some cloudy and cool mornings, today being one of them, which helps a lot. Glad you are getting rain down there in Austin! Readers, please visit Steve at portraitsofwildflowers.wordpress.com for some very beautiful photos and commentary on wildflowers and scenic places around the world. Always good to see you, Boomdee, thanks for stopping by and the kind comments! May and early June were lush and green here, and full of flowers. I didn’t post in June as too many things were going on, including harp guitar retreat. Yes, is is unfortunate iris are so short lived, and in this hot weather now, the rebloomers don’t like to bloom again. The last of the wild orange daylilies have passed, but I still have a few other kinds of daylilies going, as well as some tiger lilies. All the best to you there in Canada, my friend! The cats and crew here send their warmest regards to you, your husband and kitties.